May 1942. Another shot of Marines training with barrage balloons at Parris Island, S.C. View full size. 4x5 Kodachrome transparency by Alfred Palmer. Submitted by Brent on Fri, 11/16/2007 - 12:17pm. Aw come on Dave you know that there are people in your readership who are just as capable as Google in giving an answer. 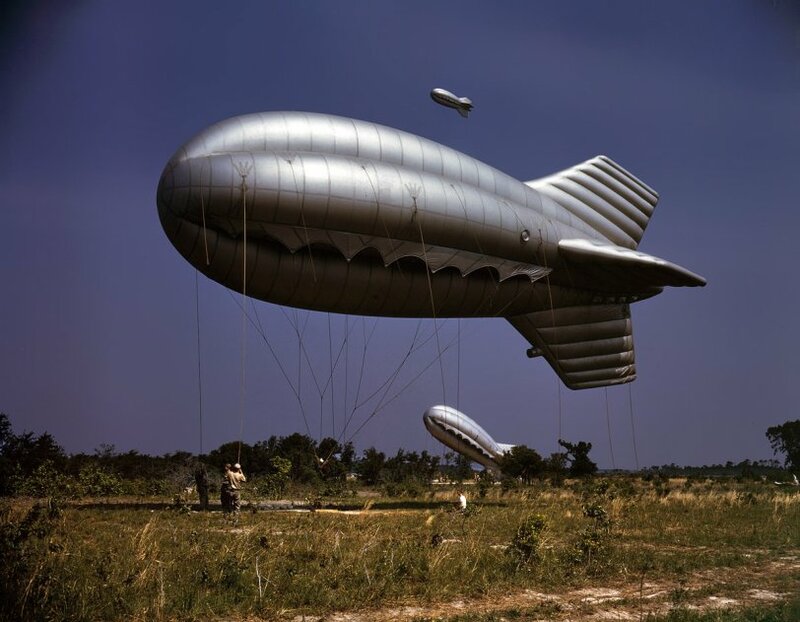 Barrage balloons were used primarily to protect fixed installations or cities. The idea was to force aircraft - specifically dive bombers - to drop their bombs from higher altitudes thereby reducing accuracy and or to force a low flying plane to change course repeatedly rather than have a straight bombing run. The cables with which a barrage balloon was tethered would be dangerous to planes - they could rip a wing off for example. The British deployed more than 400 barrage balloons over London in 1940 (during the Blitz) and by 1944 there were over 3000 barrage balloons in England. The Balloon Barrage destroyed over 200 V-1 flying bombs in 1944. Submitted by Anonymous Tipster on Thu, 11/15/2007 - 9:38pm. How were these things used? Looks like it would be a sitting duck on the battlefield.